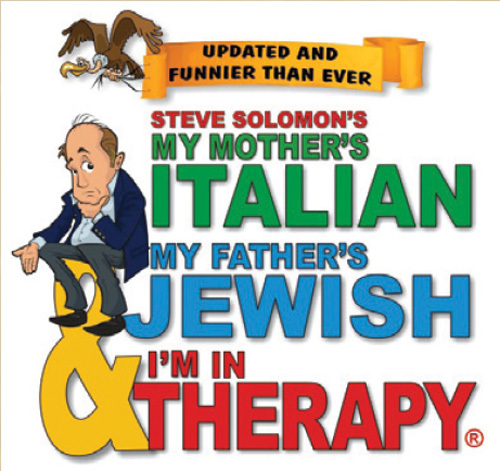 Steve Solomon – It’s the three time award winning: MY MOTHER’S ITALIAN, MY FATHER’S JEWISH & I’M IN THERAPY. Seen by almost one million people since it started touring, it is now one of the longest running one man comedy shows in history. You don’t have to be Italian or Jewish to love these shows – all you need to know is what it’s like to leave a family dinner with heartburn and a headache. There are three sequels available: My Mother’s Italian, My Father’s Jewish & I’m STILL in Therapy!, My Mother’s Italian, My Father’s Jewish & I’m Home for the Holidays and the newest hit comedy, Cannoli, Latkes & Guilt! Prepare to laugh, prepare to cry, prepare to join Steve on stage with more than twenty wild-wacky characters all brought to life by Steve’s talent with accents, dialects and hilarious story-telling.